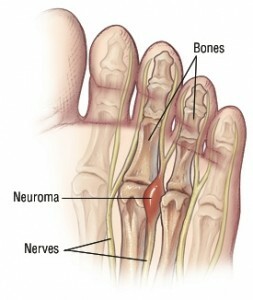 Morton's Neuroma is often called an "interdigital" neuroma because it is found in the nerves that run between the knuckles at the base of the toes of the foot. The area of the foot that can be affected include the area between the base of the 3rd and 4th toes or the 2nd and 3rd toes. Note: Mortons Neuroma is a common misdiagnosis for metatarsal phalangeal joint pathology as neurological symptoms do not always make a diagnosis of neuroma. It is however possible to be suffering from a bursa-neuronal complex, capsulitis and/or a plantar plate tear all at the same time! The good news is that in many cases the pain can often be relieved with the right pair of softer styled orthotics or insoles (even in those cases where there is concurrent plantar plate tears and capsulitis). Whilst pain relief can often be achieved with a little help, there is no magic cure to speeding up the healing process so one must take care of their feet for 6-12 weeks. As a rule of thumb a neuroma should always be treated conservatively where possible. This means icing and resting the area, trying to remove the causative factors, and providing postural control and support via metatarsal domes or, if needed, specialised pre-made or custom made orthotics. - Wearing wider shoes to reduce the squeezing force on the foot. - Addressing the foot and lower limb biomechanics. This involves looking at foot stability and if needed prescribing an orthotic device to correct your foot position. - Anesthetic & Cortisone injections. This is done when the above treatments are insufficient. The trauma is sometimes so great that conservative treatment cannot control the inflammation or cause of the pain. A series of injections are performed to control the inflammation or to temporarily settle the nerve. An ultrasound and cortisone injection can be prescribed by your podiatrist. - Surgery. This is the last and most permanent course of action. This surgery is used as a last resort as it often comes with a series of side affects including the risk of making the pain worse. This surgery can be performed by Orthopedic surgeons as well as Podiatric surgeons.